Many dogs are presented to a veterinarian because of a persistent cough that won’t go away. Chronic coughing in dogs often indicates an underlying heart problem. The most prominent condition in canine cardiology is pathology of the mitral valve. 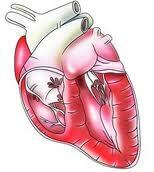 This is a valve within the heart designed to prevent backflow into the upper chamber and blood vessels of the lungs. A combination of diagnostics, including blood tests, x-rays, ultrasounds, and electrocardiograms allow us to get details about the lungs, airways, and heart so that many long term management options can be achieved. This becomes complicated due to the fact that the majority of older dogs have dental disease that bombards the airways with bacteria, worsening the disease. Also, valves that malfunction are more prone to bacterial infection, and many small dogs are susceptible to collapsing trachea so treatment of these patients become a multi-faceted task. Surgical correction is not feasible for these cases since the equipment for cardiac bypass is only available at very few institutions, but the large arsenal of medicines now available to treat cardiac diseases in dogs has allowed these patients to live longer, more comfortable lives providing the diagnostics are done to accurately assess the problem.